Our PNCWA Mentoring Program encourages teams to connect with each other and work toward a relationship that fosters personal and professional growth for both the mentor and protégé. PNCWA matches mentors and protégés based on shared interests, profession, and region and provides a Mentoring Guide to help teams get moving in the right direction. The 2019 Mentoring Program survey is now open, and pairing will begin later this winter. Each mentor/protégé will be notified of their pairing via email, and the journey begins as soon as each mentor/protégé accepts the pairing and commits to developing the relationship! Teams are encouraged to meet for at least an hour every other month, but we leave it up to the mentor and protégé to set their own goals and determine which method(s) of communication work best for them. BOTH mentors AND protégés need to complete the survey. Please complete the survey by by January 18, 2019. We will start pairing teams in late January. Please note that the survey can be completed at any point during the year, so you can still participate in the program if you miss the deadline. However, after the initial pairing, we won’t do another round (or rounds, depending on need) of pairing for a month or two (if we get additional respondents to the survey). Therefore, please complete the survey by the deadline if you’re interested in participating so you have as much of the year as possible to dedicate to the program. Accept the mentor or protégé you’re paired with, or request a change, if desired. You must be a member to participate! Learn more about membership here. 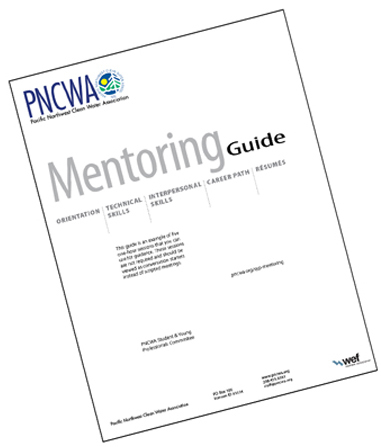 ► Download and review the Mentoring Guide: PNCWA has developed this Mentoring Guide to help mentorship teams get the conversation going during their meetings. Mentoring meetings can cover any topic the teams like, but suggestions in the Mentoring Guide include technical skills, interpersonal skills, career path, and resumes. Mentoring teams are also encouraged to set goals during their first session to provide a roadmap for the year. The mentoring program is just one of the many benefits of being a PNCWA member and presents a great opportunity for our members to connect with and learn from one another. Feedback has been positive over the past few years and we are passionate about continuing to make this program successful. So, if you’re interested in participating, please take the survey (link above) and we’ll get you paired up with a mentor or protégé. Similar to last year, we are encouraging mentoring teams to complete their commitments prior to the PNCWA Annual Conference in September. The conference is also a great time to set up an in-person meeting if you have been communicating with your team member long distance. The 2019 survey will be made available shortly after the conference to kick off the 2019 Mentoring Program. Thank you for your participation. We’re looking forward to another great year!